Fenugreek/Methi is very common in Indian cooking. The leaves are used as herbs; the fresh leaves are cooked ( see Methi Dal & Methi Aloo) and the dried leaves which are popularly known as Kasoori methi are often used to flavor a lot of dishes (as used in the Malai Kofta). 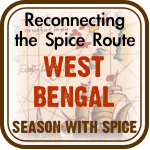 The Fenugreek/Methi seeds are used as a spice. The popularity of the Fenugreek is not just for the numerous medicinal properties it has to offer.The methi/fenugreek seeds and the leaves are subtly bitter but offers a very strong unique and distinctive flavor to any recipe they are added to. The seeds and the leaves are used in a variety of dishes, ranging from bread, side dishes, lentils, Indian cheese, meat, as a herb for grilling and even in some desserts like laddoos. I have used fresh leaves from my garden to cook the Methi Chicken. I had sprinkled the seeds sometimes early June and had a nice full grown plants by the end of July. If you are wondering what the leaves look like, I have a picture in the Methi Dal, which I had made from the fresh garden harvest. I am going to be away hoping to relax and enjoy while you are reading this post. Will be back in a week…. Make a paste with yogurt and green chili pepper. Marinate chicken with turmeric, salt, and green chili and yogurt paste for about 2 hours. Make a puree of tomato paste, water, ginger and garlic. Chop the methi/fenugreek leaves. In a thick bottomed (cast iron is the best) transfer the leaves and at medium-high heat cook the leaves while stirring until most of the moisture dries up. Drizzle some oil over the leaves and roast them at low heat for about 10 minutes, or until the leaves are fragrant and a shade darker. Set aside. Heat oil in a thick bottomed deep pan. Add the cracked cardamoms, cloves and cinnamon. 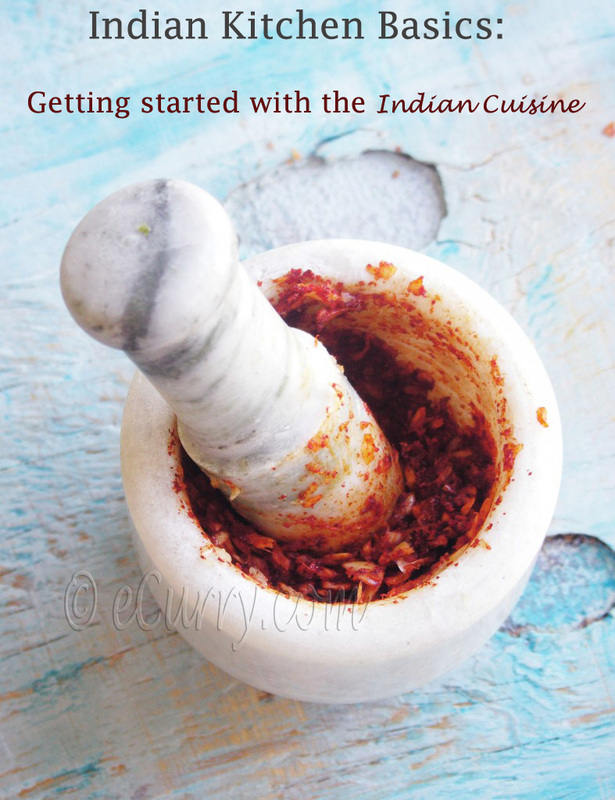 When they are fragrant (make sure they do not turn dark and burn) add the cumin seeds. When the seeds sizzle add the sliced onions and fry them for about 7-10 minutes at medium heat. Some of the onions will start to turn brown. Add half of the fresh fenugreek leaves to the oil and stir fry for about 2 minutes. Remove the chicken from the marinade and add the chicken pieces to the pan. Save the marinade. Cook the chicken while tossing them carefully till all the pieces are well coated with the onion mix in the pan – for about 10 minutes. If they stick to the bottom of the pan, just sprinkle some hot water and scrape them off. Now add the tomato and ginger garlic paste. Cook uncovered at medium heat while stirring ocassionally till the chicken is almost cooked and oil starts to leave the sides of the pan. There will be not too much liquid left in the pan – just the sauce thick enough to coat the chicken pieces and the oil. Now add the rest of the fenugreek leaves and the marinade that you had saved (yogurt and green chili paste) and 1/2 cup of water. Stir to combine. Cover and simmer at low heat for about 12-15 minutes or till the chicken is very tender but not falling apart. Uncover and sprinkle the mace powder and stir to combine. 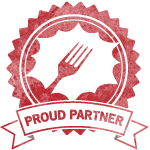 August 4th, 2010 | Category: Curries, Main, Entrees etc, Meat & Poultry, Sides & etc. The spicy look just making me to slobber shamelessly…at a glance one can say how much divinely it would be tasted…. Yum Yum Yum!!! Thats all I have to say! This looks amazing! Have to look out for fenugreek leaves! 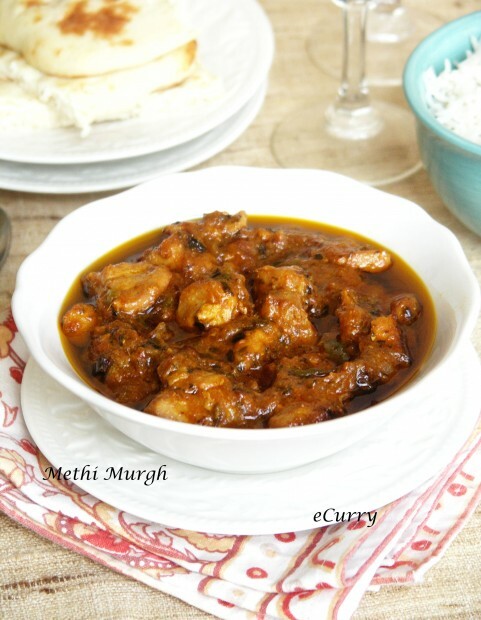 OMG.. i’ve been wanting to make chicken forever, and methi chicken is one of my favorites. this looks so good… i usually make it with kasoori methi but fresh would taste so good. what kind of thick bottomed pan are you referring too.Can you please name a brand . I cook in Calphalon Hard anodized pans/pots. They are not non stick and quite thick at the bottom – distributes heat well. Hmmmm…u got me drooling here seriously!!! Wow!!! 🙂 Feel like such a carnivore when I see your chicken dishes! Was thinking about this combo from so long…..need to give it a try……curry looks fab…..
Mouthwatering! 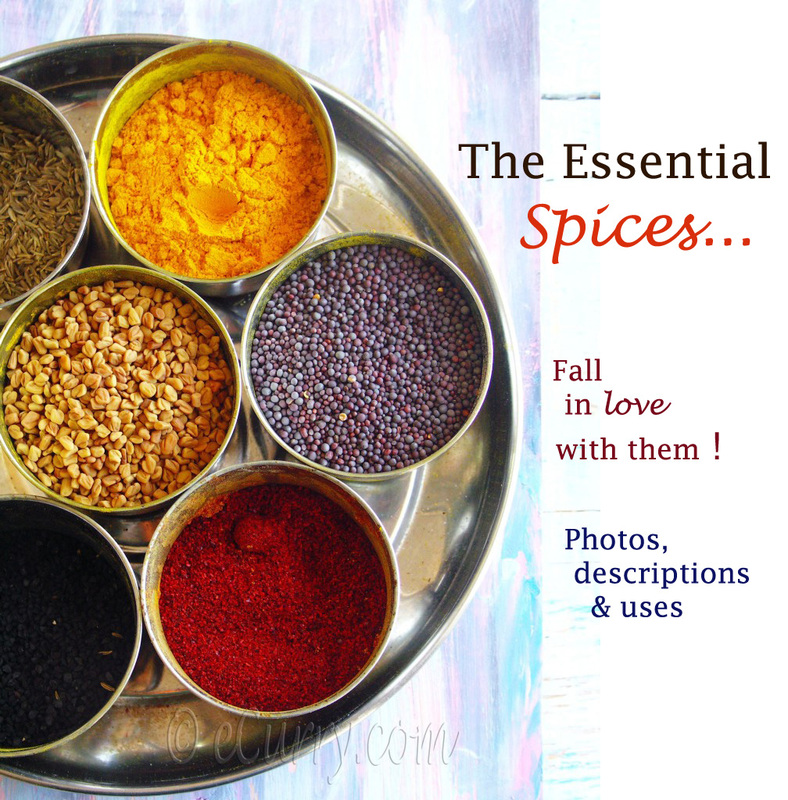 Methi is such an amazing smell and flavor… I am bookmarking! 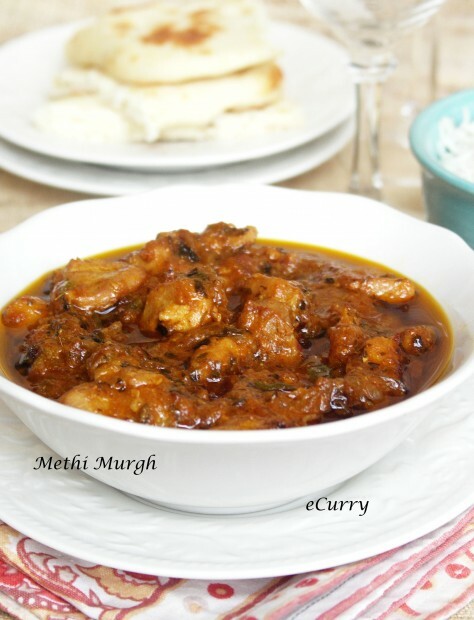 I enjoy most Indian curries but I am thinking if I have tried something similar to this…hmmmm…..
My Mum makes this Methi Chicken. Love the color of your dish. 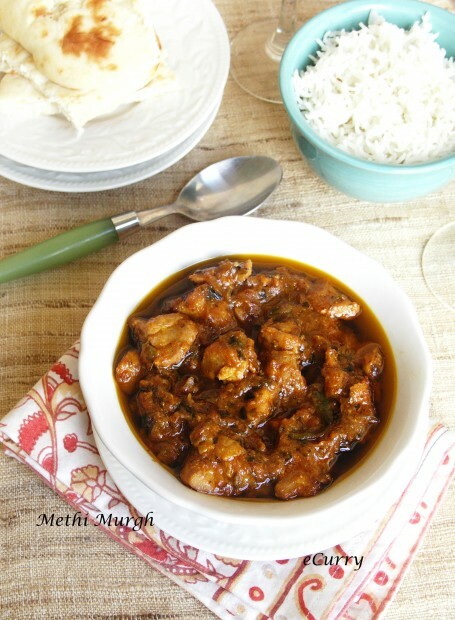 I recently made a similar chicken dish with dried fenugreek / kasoori methi. But nothing beats the fresh taste of methi leaves like you have done it. I’ve never cooked with fenugreek before, but it sounds quite tasty. I will have to find some and try this recipe, only with chicken breast rather than thighs. Delicious! I have never happened to come across fresh fenugreek leaves – I saw that you grow them in your garden. Where did you get the seeds? Or do you know of a place in the Dallas/Plano area that sells the leaves fresh? This looks like a curry worth craving! i cooked this dish for Diwali following your recipe to a tee and it was a great hit!! Thank you so much for posting such delicious and unique recipes. Thank you very much Shibani! hi, do we have to use the tomato paste store brought or the tomato puree homemade one. i am not sure which ones to use generally in the curries like this. The recipe is for the store bought tomato paste. That is why I mentioned combining it with water to make it less concentrated. Fresh tomato puree may be used too. Add about a cup of fresh puree (or even chopped tomatoes) and do not add any water. The cooking time might be a little longer to cook down the fresh puree/tomatoes and to get rid of the raw taste. The curry might have a lighter color than that with store bought paste. Prepared this evening with a huge bunch of fenugreek I picked up in Little India (Toronto) It was fantastic! Fenugreek adds such a fresh and unique flavour. 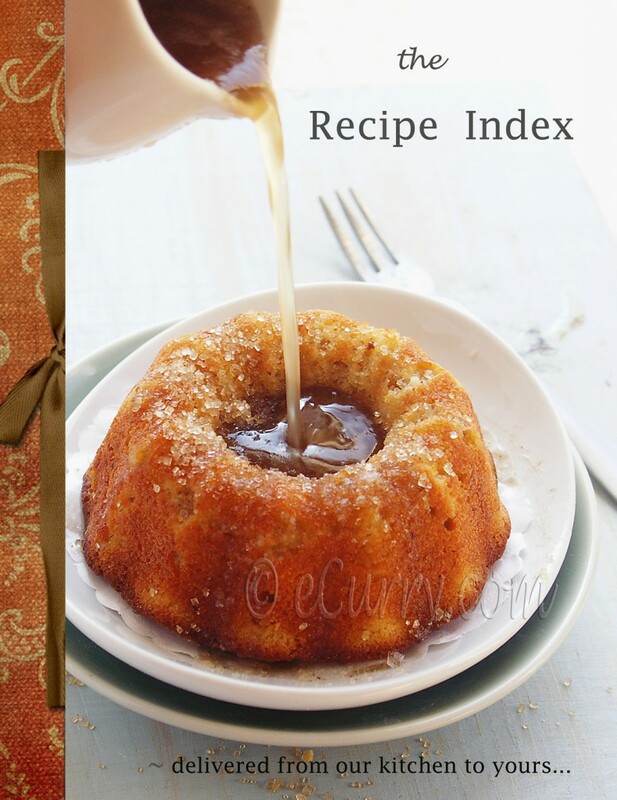 Thanks for posting…..This recipe is a keeper. I am so glad that you tried it out! Thank you! Tried it out today for lunch…..an awesome dish….. Guess will try your faluda kulfi next! This just looks so delicious. Thanks for the recipe.